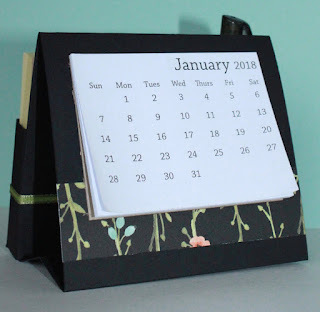 Just Julie B's Stampin' Space: Mini Calendar Project for Stamp Classes this Week! 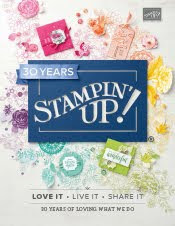 Mini Calendar Project for Stamp Classes this Week! 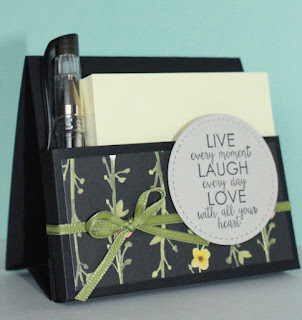 We'll be using a 5-3/4" x 12" piece of Basic Black Cardstock for our base - and I Love this!! Just a few score lines and easy cuts - then fold and assemble! And add just a little piece of Whole Lot of Lovely Designer Series Paper (1" x 3-3/4") sets off the black background underneath the calendar. And then when you flip it around to the backside - this super cute, and useful pocket, with a little bit (1-3/4" x 3-1/2") of the same DSP on it, for a post-it notepad and mini gel pen! I hope you will be coming to class this week to make this with us!